According to a recent count we’ve been to over 60 different NYC workout studios in the past few years. In that time we have also never found a definitive ranking or list of them. In a city where you can pay upwards of $30 for a 60 minute class, and time is money, you don't want to waste either in a class you don't love. So here it is!! A list of our favorites - what the class is like, best instructors, and how to book. Did we miss something? Let us know in the comments and we'll check it out. LIFTED by Holly Rillinger - We left Holly's class for the first time this summer knowing it was one of the best classes we had ever taken and months later, that is still true. There is some magic that happens in this class. Holly mixes meditation with High Intensity Interval training. She truly makes you feel fully present in the class - and leave feeling stronger and LIFTED, mind, body and spirit. The Rope or The Dance with Amanda Kloots - This high-intensity, high-vibe class will leave you dripping in sweat and smiling. The Rope takes your schoolyard game to the next level with choreography and music that will make you re-think needing a gym full of equipment for a killer workout. The Dance will make you forget you're working out at all. So hop off the elliptical and hop in to Amanda's class for a workout that you'll want to come back to. The Class by TT (aka Taryn Toomey) - Like a lot of the Studio B classes, The Class is something like you've never experienced before. Incorporating mindfulness, feel-good instructions and killer moves to make your legs shake, we totally recommend you try it out. A total body workout that includes heart-pumping cardio, gliders, kettlebells, balls and bands. Throughout the class you're bound to smile with Kira's infectious personality and yes-you-can attitude. Guaranteed, you'll feel the burn. In STOKED 360 or STOKED ABSolution you'll move your whole body and feel it! ABSolution is one of our favorite classes because Kira proves everything you think you know about ab exercises wrong - no this is not 60 minutes of crunches. Known for their high-intensity training circuit classes, Fhitting Room challenges you with a little bit of everything. You'll move from the rower, to TRX, to the assault bike, to battle ropes, planks and get high fives and cheers along the way. Our OG and favorite boxing studio in NYC. They only have one location on Bleecker St between Greenwich and East Village (aka next to some of the best brunch places for post-workout). The Underground classes are our favorite but be warned, in the summer it feels like what it is, a sweaty workout in a hot basement. The instructors actually train in boxing so they teach practical moves and combos and the class in general makes you feel like a badass. You'll be partnered up so it's a great class to go to with a friend or to make friends at. Our favorite instructor is Julian D. at the 7am classes. Tip: Bring your own wraps or buy theirs for $10. When this studio opened in 2016, we could feel the change in the fitness scene. Incorporating yoga and boxing is such a brilliant and non-intuitive idea but is just what NYC and us who live in it need - a little softness and flexibility in our daily fight. Tucked on Bond St. you'll climb up stairs literally made of motivational quotes to a dark room filled with bags and more subtle quotes on the walls. You'll start with a quick, weighted warm-up followed by 10 rounds of cathartic boxing drills on your own and with a partner. You end the class with a restorative yoga flow to leave you feeling both stronger and more grounded. A 2019 addition to this list, Liftonic brings the heat. This studio is tucked on Gansevoort St in the Meatpacking District. The austere space has everything you need without being over the top. You’ll pick up your weights and head to a bench where you can see the instructor in the front of the room and also on a TV screen (so you can stop straining your neck trying to see what they’re doing!). The vibe of the class is upbeat and challenging. There’s a lot of repetition and burnout so you will definitely leave the class feeling sore and not sorry. I went to the Arms & Abs class and there wasn’t any cardio, which I honestly appreciated. Instead we really focused in on certain muscle groups and got.it.done. Will be back!! We're actually disappointed at how long it took us to try Switch Playground. It has been called one of the hardest NYC workouts and we'd agree. In your 35 (express) or 55 minute class you'll move through 12-15 circuits of different exercises with a partner. You each work side by side as one of the multiple instructors explain your workout. Each station is 4 minutes between 2 exercises. This class will also teach you some moves that you can bring to workouts you do on your own, that is, once you recover from this class. After opening it's doors earlier this year, Rumble has quickly become a favorite among the NYC fitness scene. Snag their 2-for-1 package your first time and you're hooked. Rumble is a boxing-inspired interval class that feels like a mix of Overthrow and Barry's Bootcamp. You alternate between basic boxing drills on the heavy bag and traditional strength and conditioning training on the floor for 10 rounds. The room is dark, the music is loud and you're bound to see at least one celebrity (I have yet to stop talking about the class I took with Justin Bieber this summer.) Check out their Flatiron and Noho studios. Whether you're a seasoned runner or just want to shake up your workout routine, Mile High makes treadmill (dreadmill) running WAY more fun. Choose between 30-60 minute classes and if you're training for a longer race you can even double up on some for a long run that will be anything but boring. Each class is different depending on the day and instructor but you can expect a mix of intervals, inclines, pushes and a few sprints. The Dash incorporates 15 minutes of strength training after 30 minutes on the treads for a full body workout. This yoga class is lit. Literally. Y7 offers heated yoga classes to hip-hop music in the pitch-black, so it basically feels like your own yoga vinyasa party that lets you release anything you were holding onto before class. Let it roll off your back, truly. You'll sweat that much. Between the music and the heat, this class feels a bit more athletic and quicker than a typical vinyasa. Pro tip: Definitely rent or bing a mat towel and water! Some of our favorite instructors are Joanna Cohen and Ashley Pratt. Book it: www.y-7studio.com or Classpass. No matter the temperature outside, Brrrn is always nice and cool inside, literally. All classes are below 50F or 55F and it’s encouraged that you even wear layers, hats or gloves! Brrrn keeps the temps low to take advantage of the benefits of cool temp exercise. I did the HIIT + Slide class which felt a lot like ice skating and a fun but good workout! They also offer sauna sessions to pair after a cool workout, or to drop in separately! YTTP strikes the balance between being not your average yoga studio while also maintaining every stereotype of your average yoga studio. Their St. Mark's St. and Williamsburg locations are the most iconic with classes that DO fill up, so lay out your mat early. The classes are all donation-based, and accepting of all levels making it an easy way to catch up with a friend or incorporate yoga into your regular practice without breaking the bank. The instructors can feel like a gamble since there are so many of them and each has a slightly different style and focus but most of the sequences follow a similar flow making it easy if you're a beginner, looking for regularity or just want a centering vinyasa flow. Book it: No reservations! Just arrive 10-15 minutes early to get a spot! I have never been a November Project regular - which is something I often regret - but I think everyone should try it once. It's a grassroots morning movement that started in Boston and spread across the globe. Monday, Wednesdays and Fridays you meet at a spot assigned the day before at sunrise (6:29am or 5:29am) greet everyone with a hug and a "I'm glad you're here" and then start a smile-filled, endorphin-releasing workout. You're bound to make (more than) one friend and leave wondering why you don't always wake up this early. Other perks? It's 100% free. Too much to remember? Don't worry! We already added them to Google Maps for you. Download it here and let us know which you book first! We'd basically be late to work to make one of our hands-down, favorites but these classes are still guaranteed to make you smile through the sweat. They're dependable, fun, and normally have open spaces when your die-hard favorites fill up. It just feels wrong to have a guide without including Soul Cycle, the studio that ultimately launched the movement into boutique fitness classes. The feeling that a Soul Cycle class creates is one of a kind. If it we didn't already consider it a given, Soul Cycle would also top our list of favorite classes. We save Soul classes for special occasions that we want the mental, feel good boost for, like finals week, birthdays, New Year (highly recommend with Stevie!!) or any day you want to just ride it out and be in your own zone. Stevie, Becca and Conor are our favorite NYC instructors but we recommend you shop around and find who you vibe with most! Besides having a great name and spa services, Exhale also has some of our favorite barre, yoga and fusion classes. We've been to their locations across NYC and even out of state and they are always a dependable workout that makes you leave feeling good. Our favorite class is their Sunday Exhale Core Fusion, where you go through a circuit of different exercises, using TRX, kettle bells, gliders, and medicine balls for a full body workout that is both mindful and challenging. Their barre classes also feel less repetitive than some others, so if you're a regular barre-er this class might be a nice way to spice up your routine. Flybarre is one of the most underrated barre classes in the city. The 45 minute class uses balls, bands, weights, and the ballet barre to bring the same intensity and energy that you'll find in their cycling classes with moves that are more athletic than a typical barre class. Our favorite is the FlySPORT 60 - a slightly longer version with more cardio through jumps, lunges. The boutique fitness class of the Equinox gym you love. Similar to Studio B, each class is meant to be a unique experience that you won't find at another studio with trainers who break the mold of your typical Equinox class. The studio is tucked in on a sleepy Soho street and has it's own lounge, juice bar and coffee on tap so really, what more could you want? Our favorite classes have been Sweat with Bec with Bec Dolan & Sculpt and Strength with Patrick McGrath. One of the first studios to bring rowing to the mainstream. Similar to a spin class, you'll do a coordinated, rowing-inspired workout on the erg and strength exercises off. The Union Square location is brightly lit and airy, a nice break from the dark and intense studio rooms we're used to. Our favorite instructors are Hollis, Kenneth, and Bakari. Bonus: This location is right next to Hu Kitchen for the perfect after class meal or catchup with friends. Boxing-inspired workouts and advanced technique boxing classes in the heart of NoHo. Their Box Work class is a circuit style class that blends shadow boxing, trainer mitt work, and HIIT exercises for a total body workout. Like any studio, your experience will greatly vary by instructor, our favorite was Donovan. The OG rowing studio that made a splash in NYC. They started out just West of Columbus Circle and now expanded to Chelsea and UES studios. The classes feel more technical than some other rowing studios and many of the instructors and class-takers are current/past rowers. The workout is high-intensity, low-impact and either mostly on the rower or split time on and off with strength training. For this review, I need to admit a fear of trampolines and this is a trampoline class. But I overcame to take Tiffani's Micro Bounce class. The class is fast-paced, and you'll have your own small trampoline and use bungie cords that hang from the ceiling above you to do coordinated, bounces, pulses, lunges and jumps. No matter how un-coordinated you are, this class is super fun and a good one to do with a friend so you can laugh about it after. Seasoned Bari-goers suggest a few classes to get the hang of the moves and rhythm of the class. Admittedly not a die-hard barre person, Barre3 is one of the more fun and challenging barre classes we've found. Their West Village location overlooks 6th avenue so you can get your people watching in while you pulse to blasting music in the brightly lit studio. 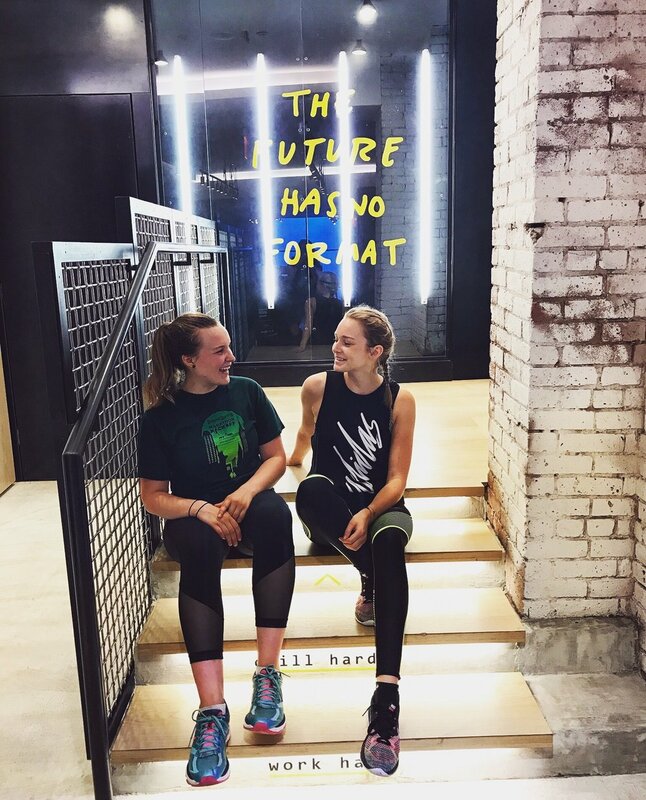 A few nice features of Barre3 is that they are national, so if you love their classes you can find studios in cities all over and they even offer classes online! If you're just dipping your toes into the barre world, you can snag one of their community classes when a new instructor is training (I did this with CJ years ago and she is one of the best!) and be sure to come in for your free birthday class! We're excited to keep adding to this list! This is the most updated version as of: 1/6/2019.